Here is a book that will fill your ears with a chorus of voices you may never have heard so clearly. What I love about this carefully introduced, large collection of testimonial essays is its variety, its unsettledness, its openness, its range. On the other hand, Muslims who know all these things may be surprised by Juan Galvan’s book too, because the voices here don’t pull punches or smooth over the problematic aspects of taking up a new religion by choice. Our Journeys is a collection of actual, living human voices reveling in the beauty of discovery but also grappling with the stresses and strains of a decision that may easily confuse neighbors and even, perhaps especially, close relations. Get ready for the sort of wild ride that only truth-tellers take you on. Sometimes religion can get in the way of truth-telling. Not in this case. 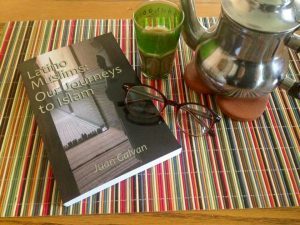 Latino Muslims: Our Journeys to Islam has been well-received on Amazon. Check out these Amazon reviews.